Rango is my chosen character, not only because 'Rango' is a masterful film, but because the character of Rango is a very deep character in terms of anthropomorphism and symbolism and one that I feel I could write confidently about. Rango is a pet chameleon who is going mad with loneliness, his only ‘friends’ are his very own anthropomorphised objects- a plastic palm tree, a headless, one-armed barbie torso, a plastic wind up fish, and a dead bug. Using his ‘friends’ as fellow cast members, Rango creates countless stories, always casting himself as the hero. In design terms, Rango’s character is displayed through his species. Chameleons blend which is symbolic of Rango’s non existent sense of identity; he is an actor and can play someone else easily, but when it comes to his own true self he is lost. Even though Rango is very realistic in design, Rango’s general body shape somewhat resembles a man with a beer gut; he walks on two legs and his body shape is more humanlike in that he has arms and legs with defined hands and feet as opposed to the more pincer like appearance of a real chameleon. 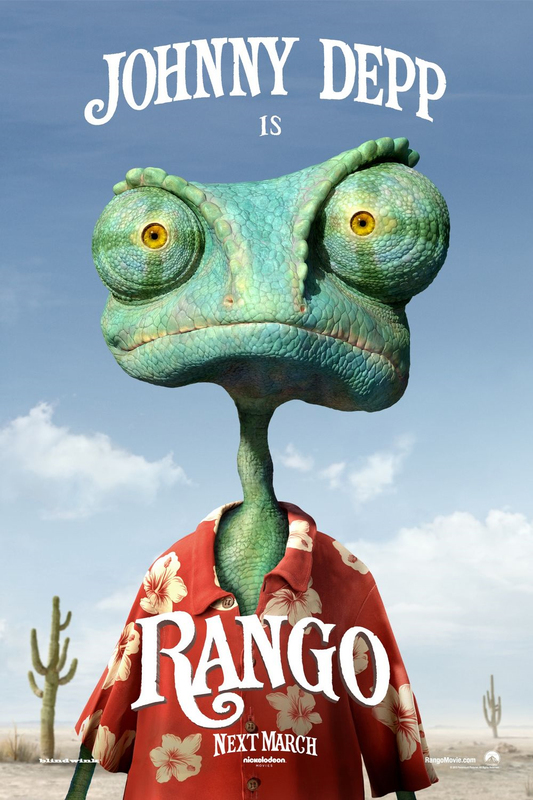 Being a chameleon with eyes that can pivot all the way around also allows for Rango’s nervous and deceitful nature to be seen through his constantly shifting eyes. Rango’s realistic chameleon appearance adds a lot of character but it creates a lot of restrictions on his facial features; his eyes are very beady which makes it more difficult for him to emote through what is considered to be the anchor of human expression, and his eyebrows are represented by the ridges running along his face, these ridges are facial ornamentation (something that is common with chameleons) and only slightly raise or lower to accommodate expressions throughout the film. It is Rango’s wide mouth that allows him to be so expressive, his mouth runs along the width of his head and his lips are purely made up of a thin yellow pigmentation along the mouth line so as not to distract from the mouth’s simple yet extreme forms. All of Rango’s facial expressions were modelled after his actor Johnny Depp, Depp and the rest of the cast acted out their parts in a studio with a camera crew recording their actions and facial expressions for direct reference. 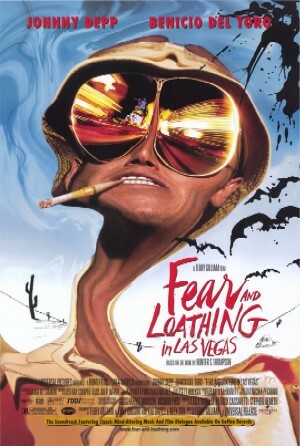 In the world of ‘Rango’, all of the animals are clothed in some way, in the beginning of the film Rango is wearing a simple Hawaiian shirt- partly as a reference to the film ‘Fear and Loathing in Las Vegas’ and more specifically the character of Hunter S Thompson, who Rango was partially based on- but within the context of the film it could be assumed that his owners dressed him or gave him the shirt. When he gets to the town of ‘Dirt’ and is promoted to Sheriff, Rango sports a variety of traditional western outfits, and later on he wears a similar outfit to Clint Eastwood as ‘the man with no name’ which is symbolic of Rango’s realisation in becoming a hero.